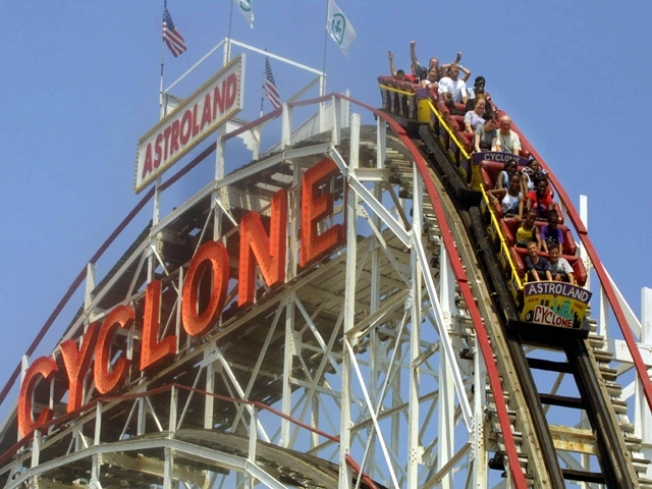 Head to Coney to ride the Cyclone on the first day of the Summer '09 season. WITH A LITTLE HELP: We're a bit puzzled by the David Lynch Foundation's mandate (teaching kids in rough situations to meditate…hmm) but we're solidly behind the lineup at the Paul McCartney & Friends: Change Begins Within Benefit Concert.Ringo Starr, Eddie Vedder, Moby, Sheryl Crow, Bettye Lavette - and of course Macca and the foundations' namesake, auteur Lynch. Radio City, Saturday, 7:30PM. MATZOH BAD: An event called Passover in Pasties really kind of speaks for itself. In case it doesn't, this is an evening of kosher burlesque. You're welcome. Slipper Room, Saturday, 7PM. WILD ABOUT HAIRY: Not all the men in Conspiracy of Beards have facial hair, though several do. More importantly, they're a 30-strong male choir that performs the oeuvre of Leonard Cohen, a capella. Niche going! Highline Ballroom, Saturday, 2PM. HANDY: The 8th Annual Juggle This! juggling festival comes to town all weekend, as pro flingers from all over the globe show you just what they can do with their pins. Schedule varies, Saturday and Sunday. RIP, TORN: We tried to get a drink at Union Hall a couple weeks ago and wondered about the line snaking down the block to get in. Then Demitri Martin and Kristin Schall (Flight of the Conchords, Daily Show) walked by. They were performing at comic extravaganza Tearing the Veil of Maya. Now we know. Lineup changes weekely, Sunday, 8PM. CYCHED: The Cyclone opens for the season! Astroland may be dead, by the coaster lives on. Borough prez Marty Markowitz presides over the grand opening and the first 100 to show ride for free. Sunday, 12PM.